Posted on November 28, 2012 by anayasblog Posted in Mexican Food	. What is different about Mexican food? I was asked recently “what is different about Mexican food compared to other foods”. Recently when I was at a local food distributor I came across an individual from Norway. He was very interested in my food purchase and started up a conversation with me. Being from Norway he has limited exposure to certain ethnic foods from the Western Hemisphere and compared his culinary experience with Mexican food, with a TV dinner he used to eat back in his home country. I laughed a little when I heard this, but assured the man that home cooked or restaurant style Mexican food is a lot better for the pallet than a TV dinner. I offered him my card and invited him to Anaya’s fresh Mexican restaurant for a taste of authentic Mexican food cooked by authentic Mexicans, and served in an authentic Mexican style. He accepted and eventually showed up at Anaya’s Fresh Mexican Restaurant to try some real Mexican food. Although I was not at work when the Norwegian gentleman came to taste our food, I did get a surprisingly good report about our Mexican food. He came in and asked for me and upon finding out that I am not usually in the store said nothing more to the staff. He ordered a combo plate with a chicken enchilada, beef taco, and shredded beef burrito. When the server delivered his food he was pleasantly surprised with the size and the portions of the food. He called me afterwards and told me about his experience at Anaya’s Fresh Mexican Restaurant. “I was very pleased” he said “never have I tasted anything so different from the food of my nationality”. He went on to tell me that Mexican food is great and he can’t believe that he never tried it before. He has since gone back to Norway but promises to visit again when returns next year. Thank you Oslo Felsing for your interest in our Mexican food restaurant, we hope to see you again soon. The following is an excerpt from the wikipedia.org website on Mexican food. Mexican cuisine is a style of food which is primarily a fusion of indigenous Mesoamerican cooking with European, especially Spanish, cooking developed after the Spanish conquest of the Aztec Empire. The basic staples remain the native corn, beans and chili peppers but the Spanish introduced a large number of other foods, the most important of which were meat from domesticated animals (beef, pork, chicken, goat and sheep), dairy products (especially cheese) and various herbs and spices. While the Spanish initially tried to superimpose their diet on the country, this was not possible and eventually the foods and cooking techniques began to be mixed, especially in colonial era convents. Over the centuries, this resulted in various regional cuisines, based on local conditions such as those in the north, Oaxaca,Veracruz and the Yucatan Peninsula. 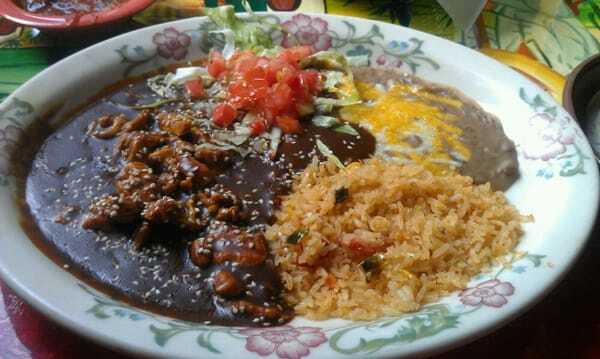 Mexican cuisine is highly tied to the culture, social structure and its popular traditions, the most important example of which is the use of mole for special occasions and holidays. For this reason and others, Mexican cuisine was added by UNESCO to is list of the world’s “intangible cultural heritage“. Come visit Anaya’s Fresh Mexican restaurant and try our authentic fresh Mexican food. The best Mexican food in Glendale Az and Phoenix. Anaya’s Fresh Mexican Restaurant is located on the border of Phoenix and Glendale just North of Olive/Dunlap on 43rd Ave. Tags: Anaya's, Fresh Mexican seafood, Glendale, Mexican food, Phoenix	.